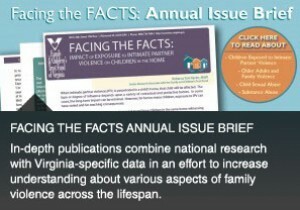 (DEV) Family and Children's Trust Fund of Virginia » Finding the FACTs: Research and Data Portal var admin_url = "http://fact.aisn-demo.com/wp-admin/"
Finding the FACTs: Research and Data Portal is a gateway to research, data and information about children, families, and older adults impacted by family violence in Virginia. Here you will find information about and links to the family violence data indicators, issue briefs, the annual FACT Report, and additional data and research resources. We invite you to explore the resources available and hope they can serve to help support the work being done in the field of family violence prevention. 6/18/15 - Finding the FACTs: Research and Data Portal is live - welcome! Please take a moment to explore all of the research and data resources that FACT has been curating. Also, please take a moment to provide feedback. 4/28/15 - FACT Blog is now live! 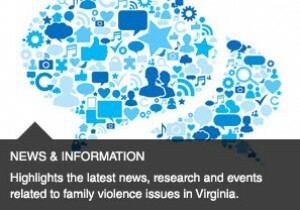 The blog will feature the latest research, data and information related to family violence issues in Virginia. 1/30/15 - The 2014 FACT Report and Issue Brief, Impact of Exposure to Intimate Partner Violence on Children in the Home are now available. 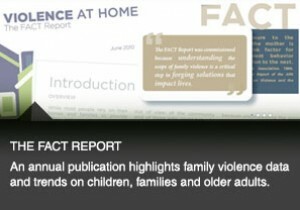 This year’s FACT Report is not only presented in a new format, but it is also accompanied by a new, online data portal that allows users to access local, regional and statewide family violence data and create interactive data reports. The Family Violence Indicator Local Data Tool now replaces the local data that was once available through the FACT Report’s Appendix. All of the same information is provided, but the portal now allows users to define and populate reports by selecting the year and locality/localities they want displayed. A glimpse of the tool’s capabilities is provided for you below. To aid in the transition to the FACT Report’s new format, we have created two additional documents: Guide to the FACT Report and FACT Report Data Guide. These documents provide information about the data indicators, family violence data limitations, step-by-step instructions in the use of the data portal and examples of how reports can be generated. In addition, an online toolkit also accompanies the Issue Brief for those of you who are interested in additional resources that are related to the impact intimate partner violence has on children. Along with these documents, FACT will be providing technical assistance through the use of online training modules and ad hoc requests for support. Requests for assistance should be directed to: familyandchildrens.trustfund@dss.virginia.gov. Over the years, we have found that many stakeholders use FACT’s publications as a way to encourage collaborative work across service sectors. I encourage you to share these publications with your staff, community partners, and any other key leaders who might find it useful. It is my sincere hope that you will find these resources helpful to you and your community partners. Regardless of how you choose to use this information, we hope that the provision of these resources helps promote evidence-informed prevention and treatment practices in your communities. 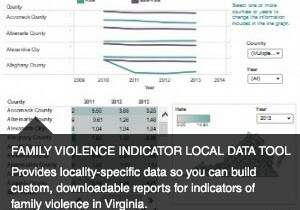 Using the Family Violence Indicator Local Data Tool, you can build custom, downloadable reports for indicators of family violence in Virginia. An annual publication highlights family violence data and trends on children, families and older adults. In-depth publications combine national research with Virginia-specific data in an effort to increase understanding about various aspects of family violence across the lifespan. Highlighting the latest news, research and events related to family violence issues in Virginia. A listing of data and research sources that provide information about family violence and related topics. Emphasis is placed on data specific to the Commonwealth of Virginia.